This is supposed to be a young adult book but some of the stories about the Chicago Fire are harsh and gave me the shivers. I think it would be a great book for tweens who had previously read books like Dear America. This is a non-fiction, award winning account of the Great Chicago Fire. Being a Chicagoan and a history undergraduate major, I found this topic most interesting. Most people are aware of the legend that the fire was started when Mrs. O’Leary’s cow kicked over a bucket, but Murphy unravels the history of this fire and reasons behind it. Interesting one can attribute this breadth of this tragedy to class discrimination, as the fire started in a working class neighborhood, thereby perhaps not getting the quick attention it needed. Through the book there are photographs, articles, and testimony that bring this event from the past alive with details and insight. A great work of nonfiction to use in the classroom to use for teaching about primary source documents. This popular history reconstructs the story of the 1871 Chicago Fire largely from the perspective of those who were there. The author utilizes these first-hand accounts to highlight how a series of human errors and prejudices led to the fire's rapid spread, despite the fact at the time Chicago had one of the most sophisticated fire alarm systems of that era. This account is both entertaining and informative and is well worth the read. *5 Stars*Before reading another of his Children's history books, I had written off non-fiction history books labeled for Children or YA because...they JUST WEREN'T GOOD! They wrote down to their readers, as if people without at least a college education couldn't hope to comprehend anything "history". I learned history on my dad's knee and he never talked down to me. So I skipped YA and children's and when straight to reading adult books. Some were extremely difficult to get through and I never got everything. It wasn't until graduate school that I was introduced to Jim Murphy through his An American Plague: The True and Terrifying Story of the Yellow Fever Epidemic of 1793, also a Newbery Honor Book as well as other awards. It was at times a difficult book for me to read, as the writer does not pull any punches, so to speak. It does not glorify in the disgusting, but it doesn't lie and try to write it down to what the author thinks they should hear. It is a history text with sources, lists of further books to look into, and (most importantly) it is based on mostly primary sources - aka, writings from people who WERE ACTUALLY THERE! Most history text in high school, never mind for children, wouldn't dream of using primary sources but rather secondary or even tertiary sources - texts and books written from other sources that were written from other sources that were written from primary sources. When this happens the heart of history is distilled down until it is dry and boring; something most people argue when they talk about why they don't like history. But when a young person reads what someone actually experienced, particularly when at least one of those people is someone of a comparable age, it ceases to be boring and not interesting but rather something that can actually touch them. They can understand and empathize and perhaps, want to learn more. The same can be said for this book. *The Gush*The author does an excellent job of walking you through the hours during which Chicago burned. It is a, sadly, easy subject to keep a person's interest as the sheer detestation is almost unbelievable. The people whose words he gives voice are good choices from various sections and equally various backgrounds. What they see and how they interpret the events changes and he does a good job of pointing this out and helping the reader understand why. He never suggests you don't know better or you can't learn but rather teaches you without you even noticing. The writing flows well and keeps the readers focus well. The illustrations are well chosen, places carefully and with thought, and aid the story a great deal. The best are the I believe four maps of the city that show the path of fire as it is during the chapter you just read. This aids tremendously, as most readers won't know where places are, and they are easy to flip back to to check where the person is as you read. 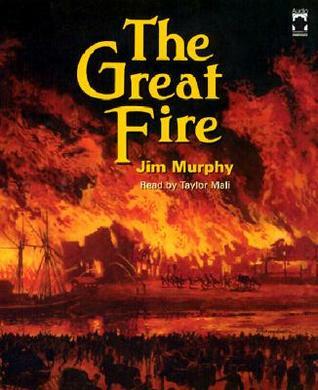 Murphy writes the facts of the fire and waits until the last chapter to deal with the myths surrounding the fire and why they exist and how they were used. Even I learn a great deal in this chapter and was very surprised. He helps lead the reader to critical thinking, something every child should learn and something that is lacking in much of our history texts. Names and dates are all very well, but society and WHY people do things are often even more important. All in all, a fine history book that is equally fine for children and adults. *The Rant*Little here other then at times the descriptions might be a bit too much for younger readers. Parents might want to be aware. They were not graphic however and most children should be able to handle it. *Conclusion*A wonderful children's history book that treats its readers better then many adult popular history texts do. A great way to learn about The Great Chicago Fire whether you are a child or an adult. This book is nonfiction and is written for more Advanced reader. This book is a Newberry Honor Book, Boston Globe-Horn Book Nonfiction Honor Book and NCTE Orbis Pictus Award winner for Outstanding Nonfiction.This story was written for more advanced readers such as 5th grade and above. This story is about the major Chicago fire in 1871 that changed the lives of people forever.I rated this story with 5 stars. There were some pictures that were hand drawn and some photographs. The story was told in a way and had a word choice that would pull the reader in and want to know what happens next. It reminds me of 9-11 and how so many people died because of that terrible day. Both types brought the story to life. I think that if readers read this story now and were asked to relate this story to a event they could relate. The youngest age group I would suggest this book be given to is 5th grade. Children that age and older would be able to understand what happened in the story and be able to relate to it. Children could discuss how the story made them feel and how they would feel if they were in that situation. This is a very different version of the story of the Chicago Fire than I have ever heard before. It uses real accounts from various people, photos, maps, and artifacts to tell the story of the errors, mistakes, and confusion that made the Chicago Fire the infamous disaster it became. Listening to this book had both its advantages and disadvantages. The advantage was the way it was read. Listening to the various accounts of actual people who were involved in the Chicago Fire read with such energy were both exciting and intriguing. The disadvantage of listening to the book is that it (apparently) has a number of pictures, diagrams, maps, etc. that are (obviously) not visible to the listening reader. As soon as a copy of this book becomes available at my library, I will have to go back and see all of the visuals that were missing in the audio. Grades 4 (advanced) and up. I still remember when I read "Blizzard" by Jim Murphy. It was August and I was working on a siding job in the blistering sun in the hot hot heat. Haha, very interesting timing to read a book about people freezing to death and 20 feet of snow etc...Now I'm in Mongolia. How appropriate if I could say it was one of those great -30 degree days.. However, it is March, and it was lovely Spring weather. Oh well. Bad timing.Anyway, who knew that it WASN'T Mrs. O'Leary's cow that started the great Chicago Fire?! The book that takes the facts and tells the story, I learned a lot about the city of Chicago and the events of the fire. :) I enjoyed it and the author's other book, Blizzard. I recommend them! Awards Won: Newbery Honor (1996)As someone who is not a native Chicagoan, I found this book very fascinating and educational. The photographs that accompanied the narrative provided a great mental image of the destruction that Chicago faced that tragic night. I think that this would be a great book to use when third graders learn about Chicago. The book is definitely appropriate for older readers, but could be used for a whole group read-aloud to engage the students. Other content areas could also be incorporated such as social studies, science, and math. Students could create map showing the course of the Chicago fires, build structural replicas of Chicago, and much more! This book is good for people who are interested in history, or how it happened. It was a good book but, I'm not really into history books. It jumps around a lot, so I found it really hard to know from who's point of view it was coming from. Although my children & I learned about the Chicago fire from this book, we all found it to be, for the most part, very dry & boring. How many different ways can you say that a fire spread? I found this book an interesting read. At times it could drag on with details while at other times the action and anticipation felt by the characters led me turning from page to page to find out what happened. I really appreciated the first-hand accounts that were told in a story format and woven together to more or less occur at the same time. These parts of the text were the most engaging as a reader. It was interesting to see so many people reacting to the disaster the way I would expect people nowadays to react, both helpful to each other and acting out of selfishness. But some reactions baffled me such as crimes occurring in dangerous areas while the fire raged such as stealing, violence toward other including children, and even people deliberately starting fires. I felt angered toward the bad decisions that could have ended the fire early on as well as the bigoted opinions of the lower classes and immigrants. I was disappointed that many would rather blame and outright lie innocent people such as the O’Learys, firefighter who put their lives in danger, and the poor. It was however quite interesting how the city quickly turned around with rebuilding taking places soon after and businesses starting again right after the fire. It was also encouraging to see how much and how quickly support came from other cities and even other countries. The illustrations and photographs were an amazing edition. They added a great deal to the telling of the story. Being able to see the destruction, the panic, and the extent of the damage to the city and its people was invaluable in those pictures. The maps were very helpful in illustrating the spread and extent of the fire. The writing of the story overall was pretty dry and fact orientated (though great for revealing true facts). However the writing of the eyewitness accounts from direct quotes were eye opening and full of detail one can only get from a first-hand experience. The organization of the information in a timeline of what occurred with facts interspersed with first-hand accounts was a great choice. It leaves the reader wanting to know what happens next and worrying for the “characters’” and their families’ survival. Accuracy is a real key to a well written nonfiction book. This book is well researched and explains assumed details from the story based on the information given such as details of what happened to the people not given in their own accounts. Facts and information is cited many times in the story and a complete bibliography and index is located in the back for further checking. This is a wonderful account of the historical Chicago Fire of 1871. I like how it reads as a fiction story in the beginning, and many chapters throughout. My favorite part would be the pencil drawings and captions that accompany them, and the actual photographs. I like that the author notes that newspaper media sources of the time had a tendency to embellish on facts and flat out make up stories particularly the story of Catherine O'Leary and her cow.I found the final chapter titled "Myth and Reality" to be my favorite. One of my favorite quotes is found on pg. 131, "Chicago was know throughout the United States and the world as the Queen City of the West and the Gem of the Prairie. It was, in every way, a shinning symbol of the wealth and unlimited potential in the United States. Then, in the space of a night and a day, this was all reduced to ashes. Gone." I think learners grades 5-7 would really enjoy this book. I think it could be used in a few projects and would be great for a inquiry history unit. I have a personal interest in architecture, and am left with many questions as to the reconstruction of the city that never sleeps. For a short read, this book was extremely compelling. Although full of facts, Murphy offsets them with journal excerpts from those who experienced firsthand the Chicago Fire of 1871. I enjoyed learning about the real Mrs. O'Leary, from whose barn the great fire started; how fire prone Chicago's buildings and homes were due to most everything being constructed solely out of wood, the critical misdirection of fire departments which greatly detained much needed help; and the mass chaos that ensued as families rushed away to attempt to find safer parts of town, only to have the winds turn and bring the fire's flames even closer. I was surprised to read how horribly inaccurate the subsequent news reports were after the fire was contained; reporters and editors alike created all kinds of stories to point blame and encourage scandal, especially directed toward poor Catherine O'Leary. I did not realize before reading this book how susceptible most big cities were to fire, as well as how many smaller fires occurred on a regular basis. This book definitely allows the reader to absorb the experience of Chicago's Great Fire. NONFICTION/INFORMATIONALI was familiar with the devastating event that was the Great Fire, but this novel gave an enhanced perspective into the details that transpired with first-hand narratives and action that bring the fire to life through an exiting narrative. Beginning on a Sunday evening, a small fire broke out in a barn, but gradually the fire grew and spread. Due to how common of an occurrence fires were during the time, many people did not adhere to the warnings. The city primarily made of wood was devoured by the fire which fire fighters could not find the cause of until too late. The most inspiring message that this novel gives is the way that the people, over 1,000 homeless by the end, rebuild their city of ruble. The story is set in a way that it does not feel like the reader is learning history, but rather experiencing something of fiction. It is captivating and exciting that even young students could be interested in the text. The Great Fire is an interesting history book that describes the huge fire that nearly wiped out Chicago in October 1871. The experiences of several real people are described, which brings the story home and helps readers feel empathy for those affected. The aftermath of the great fire is also explored, as well as the trends of reporting and journalism of the time and how they helped spread mostly false and inflammatory information. I recommend this book for readers in grades four through six, and anyone interested in an overview on this event. I listened to this book rather than reading it, which I think was a disadvantage. Didn't realize it was a Newbery honor book or meant for a middle school audience so rather disappointed in how it told the story but now I understand. I think the photographs and maps that the book included would have been helpful. Last chapter was the best, when the author talked about the lasting changes to Chicago and cities in general caused by the fire. I really enjoyed this book on Chicago's Great Fire. I now know that the cow kicking over a lantern was a tale that was told; I had always thought that as well! The photos are amazing- and it was interesting to me that people of the time likened it to the aftermath of some southern cities after the Civil War. Newbery honor book from 1996 that I had somehow missed. Good book if you enjoy this type of reading. I liked the progression of the story. Reminded me of Isaac's Storm ... just a YA version of that type of story. I listened to it via audio....it was real good. The narrator did very well, it kept my attention & I learned something about history. It was also a perfect length.....short/doable/worth it! Read to be able to review me son's school project on the topic. It is appropriate for 4th or 5th grade and very informative. With first hand accounts, this non-fiction book is readable and interesting. This was a fascinating retelling of the events during the great Chicago Fire back in 1871. Filled with illustrations of pictures that were taken during the fire, along with first hand experiences. This was a pretty good look at a crazy huge fire! I like that this incorporated personal accounts. A quick book on an interesting topic.